Need clearer wort? Quicker chilling times? Perhaps higher hop utilization during flameout? Achieve all these desires and more, with the new Weldless Whirlpool Arm by Fermentap! Designed for installation underneath the handle of your kettle, this piece of equipment will allow you to achieve a perfect whirlpool in your Boil Kettle. Simply pump your wort from your ball valve, into this piece, which will jet around the inside of the kettle, forming a strong whirlpool. The advantages to a whirlpool are many. It will settle Trub in the center of your kettle, making it easy to pull clear wort from your ball valve. The whirlpool will result in a much higher chilling efficiency if using an immersion chiller, due to the increased turbulation of wort. On top of this, the increased flow will result in higher extraction of hop oils and flavor during flameout additions! The Fermentap Weldless Spigot is made of 100% stainless steel, ensuring it will be used in your brewing for years to come. It features a 1/2" Full Port ball valve and a 1/2" barb. The inner barbed elbow is 3/8". The bulkhead is a specifically engineered piece of stainless, made for brewing! 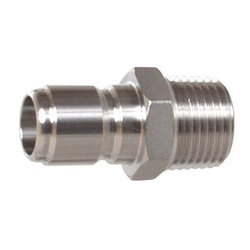 It features a 1/2" MPT outlet for hooking up your ball valve directly, along with FPT on the inside for connection of any brewing accessory you might want! You will need to drill a 1" hole for installation of this weldless spigot. We recommend a Step Drill Bit for this.